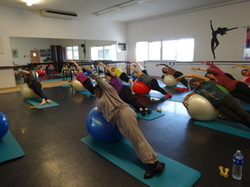 The Pilates Method represents a unique approach to exercise that develops body awareness, improving and changing the body's postural and alignment habits and increasing flexibility, strength and ease of movement. Developed from the rehabilitation techniques of Joseph Pilates, the slow and controlled approach to exercise that Pilates adopts can also help to relieve stress and tension, help with back problems, assist in injury rehabilitation and improve body awareness. Matwork Classes for beginners and improvers are held during term time at KDance, Léguevin. The class size is limited to 14 per group. Private sessions are available for individuals or small groups. These are normally held in a private Pilates Studio in Lévignac. Contact me for further information.